As part of the Scholastico-Ecoballot merger, the Ecoballot Ballot-Blog is being discontinued soon. We’re moving some of the best posts (like this one) from that blog to the Scholastico News. If you are a student government representative, you might be trying to convince your school director, principal, or student council leadership to improve your school’s impact on the planet. A great step is to reduce the amount of paper your school uses. And an easy way to do that is with paperless elections through Ecoballot. 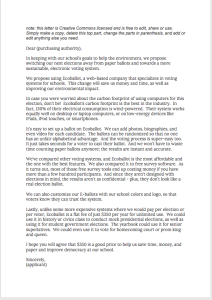 To get you started, you can copy this letter and use it to help convince your school to use Ecoballot. The contents of the letter are Creative Commons licensed so that you can modify and share the letter without worry. There’s a Google Doc version of the letter as well, which might make it easier to edit. In keeping with our school’s goals to help the environment, we propose switching our next elections away from paper ballots and towards a more sustainable, electronic voting system. We propose using Ecoballot, a web-based company that specializes in voting systems for schools. This change will save us money and time, as well as improving our environmental impact. In case you were worried about the carbon footprint of using computers for this election, don’t be! Ecoballot’s carbon footprint is the best in the industry. In fact, 130% of their electrical consumption is wind-powered. Their system works equally well on desktop or laptop computers, or on low-energy devices like iPads, iPod touches, or smartphones. It’s easy to set up a ballot on Ecoballot. We can add photos, biographies, and even video for each candidate. The ballots can be randomized so that no one has an unfair alphabetical advantage. And the voting process is super-easy too. It just takes seconds for a voter to cast their ballot. And we won’t have to waste time counting paper ballots anymore; the results are instant and accurate. We’ve compared other voting systems, and Ecoballot is the most affordable and the one with the best features. We also compared it to free survey software. As it turns out, most of those free survey tools end up costing money if you have more than a few hundred participants. And since they aren’t designed with elections in mind, the results aren’t as confidential – plus, they don’t look like a real election ballot. We can also customize our E-ballots with our school colors and logo, so that voters know they can trust the system. Lastly, unlike some more expensive systems where we would pay per election or per voter, Ecoballot is a flat fee of just $350 per year for unlimited use. We could use it in history or civics class to conduct mock presidential elections, as well as using it for student government elections. The yearbook could use it for senior superlatives. We could even use it to vote for homecoming court or prom king and queen. I hope you will agree that $350 is a good price to help us save time, money, and paper and improve democracy at our school. And here’s a slightly different version if you aren’t a school – Ecoballot is also available to clubs, organizations, committees, professional associations, homeowner’s associations, worker’s unions, or anyone else who needs to do their voting online. This entry was posted in Ecoballot and tagged election, letter, purchasing, template, vote. Bookmark the permalink.